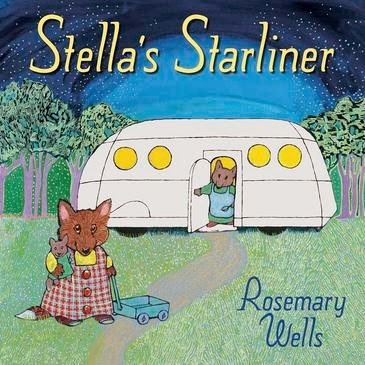 From Rosemary Wells, author and illustrator of the gorgeous Max and Ruby series, comes the story of Stella’s Starliner. Stella, a gorgeous little fox, is clearly a Wells creation. One thing you should know about Stella is that her daddy has to live somewhere else during the week, so he can work. He comes home at the weekend and they have all kinds of fun together. Another thing you should know is that Stella doesn’t live in a regular house. She lives in a house by the side of the road - a beautiful silver starliner (a mobile home) where there’s room to eat, sleep and everything else her family needs. Stella loves her silver house, but there’s just one problem. The weasels tease Stella because her house is different. That makes Stella sad and because she doesn’t want to upset her mummy, she doesn’t tell her. But mummy knows something is wrong and Stella soon discovers just how special their silver starliner is. Stella’s Starliner is an exploration of what makes a home a home, and a reminder to children of all ages that it’s ok to be different. I love Rosemary Wells’ books and this is no exception. Must read.